"res·ur·rec·tion": n. 1. The act of rising from the dead or returning to life. Troy Alves is a man who has, indeed, "come back from the dead." After placing 11th at the Iron Man Pro in January 2009, Troy gave himself an ultimatum - win your next show or be done with professional bodybuilding. Troy was far from done, in fact he was more determined than ever. After refocusing his mind, team, and spirit, Troy did win his next show - the April 2009 Europa Show of Champions - and qualified for the 2009 Mr. Olympia. This DVD chronicles Troy's continuing journey as he prepares his classic "X-frame" for his next competitions - the September 2009 Atlantic City Pro, and just two weeks later, the 2009 IFBB Mr. Olympia. See Troy's workouts, cooking/diet, grocery shopping, family time and various interviews. You'll really get to know Troy and what makes an athlete of his caliber tick. At age 43, Troy is in the best shape of his life and takes the time to share what he has learned. He is a highly experienced professional bodybuilder with a wealth of experience behind him. Watch as Troy - a true example of class, dedication, and perseverance - continues his "resurrection" as an IFBB Pro Bodybuilder. NOTE: Troy is competing in February in the 2010 Phoenix Pro (his hometown) -- and is poised to take a top spot. Troy won the 2009 Europa Show of Champions, had a top three finish at the 2009 Atlantic City Pro and competed at the 2009 Olympia. Troy is an IFBB Pro with a lot of momentum going into 2010. See CONTEST HISTORY below. Please click here to see Troy place 2nd, 2003 AUSTRALIAN GRAND PRIX, GMV-530DVD. The first Olympia qualification. 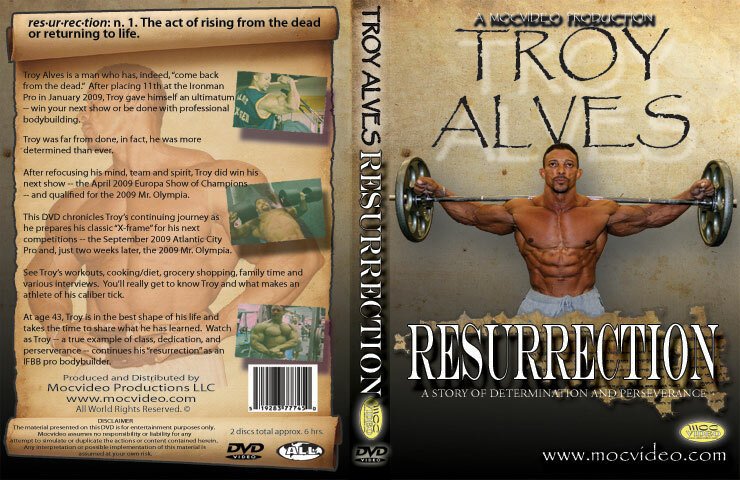 Please click here to see ALL DVDS IN WHICH TROY ALVES IS MENTIONED. A MOCVIDEO produced by Bruce and Lee Lester.